This is the final article in the Road to Sparta series and covers my final race preparation, race logistics and then a post race analysis of my performance. The month of September was just over three weeks out for the race. I had decided to have one further week of reasonable mileage before a final marathon run two weeks out. The final three weeks would then see a gradual reduction of mileage by at least a third each week (i.e. from 80 miles to 60/40/20). 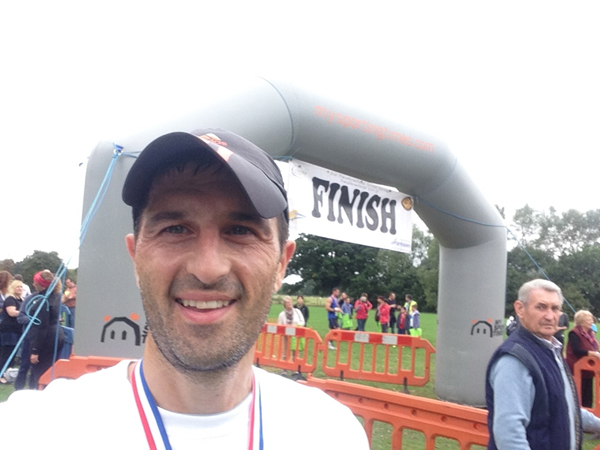 I reduced my two runs a day down to one before my final marathon and then ran the Farnham Pilgrim marathon in a comfortable 3.55 which was where I wanted it to be. It was an undulating course with a few hills, some narrow paths and stiles which would have added a bit to your road marathon time so just under 4 hours felt about right. I had a day off after the marathon and then just ran easy paced once a day efforts of a few miles for the remainder of the week. The last weekend of the race saw me drop my idea of an easy 10 mile run and I took part in a local 10k event which went well where I set a new PB of 41.05 (41.09 official time as no chip timing and I didn’t start near the front) without really going for it at the start. I suspect the fact that I didn’t go all out at the start meant I could maintain the pace throughout the race and it was probably a better pacing strategy for me. This was a nice little confidence boost just before the main event of the year. The last few days saw me organising kit and drop bags which were pretty much packed in advance barring electrolyte drinks as I had intended to buy some bottles of water and make these up before the race and some compeeds and cream which I hadn’t made a final decision on where to place these. I also made sure I packed my running kit in my hand luggage just in case anything happened to my bags during the flight. I flew from London Heathrow to Greece and suffered delays and lost baggage with only half of my luggage making the trip. This contained most of my drop bags but no casual clothes and I was thankful I packed my running kit in my hand luggage so at least I could start the race. Athens airport is about a 30-minute drive from Glyfada where the nominated race hotel was located. However, as I knew this was going to be shared accommodation with up to 4 people in a room I booked a hotel separately. I wanted to ensure I had some space, privacy and was well rested before the start of the race. I stayed at the Four Seasons Hotel which was located about a mile away from the London Hotel (the nominated hotel for British runners). However, some of the other British runners stayed at the Oasis Hotel which was much nicer and just across the road and so would recommend this as a venue next time. This takes place on the Wednesday and Thursday and we got there fairly early on to avoid the queues. Registration involves handing over your race entry form and medical certificate and collecting your race number and ID card which you should carry with you and display, supporter’s pack, certificate and a goody bag. The rear of the hotel was the assigned location for delivering your drop bags. 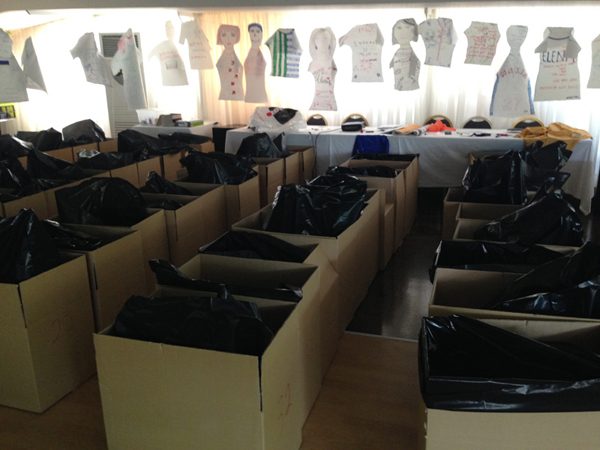 Essentially a large cardboard box is labeled for each checkpoint 1 – 75 and you can deposit your own personal drop bag with your number and this will be transported to the specific checkpoint location. Drop bag strategy can vary between runners. I went for a drop bag at every fifth checkpoint (approximately 10 miles or so). My theory was that I could easily remember where my bags were (5th, 10th, 15th 20th etc.) and this allowed me to collect food on the go at regular intervals and I placed required equipment (head torch, extra layers, sun cream etc.) before I thought I actually needed them. I also placed some spare kit and equipment in later bags in case anything broke, was lost or I needed something extra. I bought a load of red drawstring bags off eBay which were cheap, easy to spot and easy to tie together. This made it easy for me to spot the bags when I arrived at each checkpoint. Food wise, I packed some snacks in each bag. I placed 2 or 3 different things in each bag to give me some choice. These were generally welsh cakes, flapjack, rock cakes, nutri-grain bars, fruit pots (daytime), rice pudding (evening/night), shot-blocks, wine gums, salt and vinegar peanuts, trail mix (peanuts, raisins and chocolate drops) and a few other bits and pieces. I also bought a load of bottles of water and made up some electrolyte drinks which I placed one in each bag. I omitted to pack a few items due to the delayed baggage issue. My other bag eventually turned up t the hotel about 90 minutes before drop bags were due to be delivered and I had a bit of a last minute rush and forgot a couple of things. I also packed a few euros having read Rob Pinningtons report last year about stopping at a petrol station for an ice cold drink. However, following the race briefing and warnings about receiving assistance could mean disqualification I decided not to bother with this. I wanted to travel light and wore a Scot Jurek Twin Bottle Hydration belt which had a front pouch for my phone and some SCaps! and a small rear pocket for my GPS device. I wore Ron Hill trail cargo shorts which meant I could carry some shotblocks and emergency gels (I didn’t use any gels during the run) in my back pocket. I carried some wet wipes in my rear pocket and wore shades, buff (which I soaked at each checkpoint and wore around my neck) and my lucky hat. I was all set to go! I did carry the sun cream I picked up on the second day as the last 30-40 mile section is very exposed and felt really warm and applied this a couple of times to prevent me from burning. The race was broken down into 3 key stages. 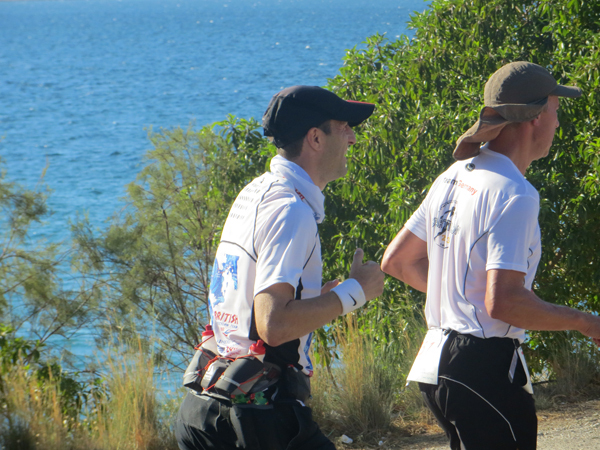 The first 50 miles to Corinth starting with a 4-4.30 marathon and then covering the 50 miles between 8.30 – 9.00 hours. 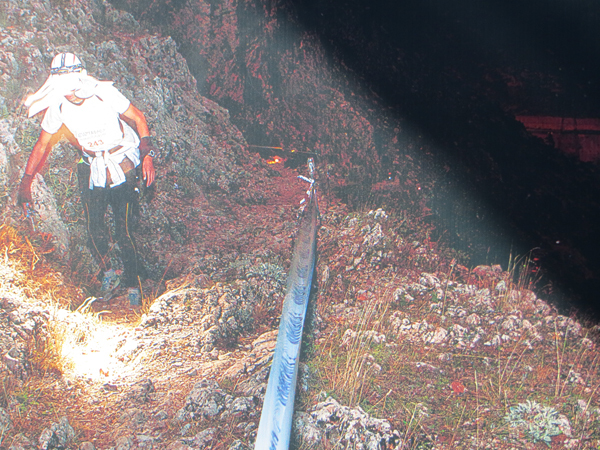 The second 50 to the base of the mountain which I wanted to cover in 20-21.30 hours. If I could get that far then I would have 14.30 – 16 hours to cover the mountain and the last 53 hours which I could achieve by marching and would be fairly confident of finishing from this point. I wasn’t going to stick rigidly to any mile splits but just see how I felt and keep a casual eye on the time and try and ignore the pressure of the cut-offs. I had planned to take an SCap every hour and perhaps one every 2 or maybe even 3 hours at night when I slowed. I ran the first marathon in just under 4 hours and 50 miles in 8.15 and whilst this was around a PB for the distance, it felt comfortably quick and I had plenty of energy in the tank. This also gave me a 1.15 buffer over the cut-offs and so I didn’t really feel any time pressure. I started to struggle with the quads between the 50-100 mile segment but still got to the base of the mountain (about 100 miles) in 20 hours which was a 2.5 hour PB for me and 2 hours ahead of the cut-offs. The last third was basically a fast march although I did start to struggle on the last 20 miles when I slowed down. I had plenty of time in the bank and saw a 2 hour buffer reduce to about 50 minutes but my last 10 miles were pretty slow as I was feeling pretty beat up around this point. However, I knew I had time in the bank and was not under any real time pressure as I could afford to leak a few minutes every checkpoint. Upon reflection most of my pre-planned tactics went well. The key lesson learned for me was the impact of the roads and undulation on my quads which were very sore to the point that it hurt to run. If I was tackling the race again, I would definitely enter a few more road marathons or road ultra’s to build up some better resistance to the roads. There was a slight disappointment over the amount of miles I marched and did not run but I would have absolutely taken any sort of finish before the start of the race and can’t really grumble about a Spartathlon finish. My feet were also pretty blistered. It hadn’t helped forgetting to pack a few supplies (compeeds and cream) but I did change socks every 50 miles. The blistering was probably a combination of the pounding on the ground and my slightly ungainly march towards the end. I didn’t feel the blisters until after the mountain section so suffered more in the last third. I might review my sudacreme and compeed routine as it compeeds basically ruin expensive socks and its pretty painful trying to remove a compeed when its stuck to the blister. Observations welcome here.. I should get round to reading that “Fix your Feet” book. I was quite pleased with my fitness going into the race with the amount of miles I had banked, improvements in race time and physical condition (pre-race I was the same weight I was 20 years ago). I think my regular “easy” hill reps each week did help with some of the incline running as I felt I was making better slightly better progress up the hills than the people around me. Overall, I couldn’t grumble about my training and preparation. I was fortunate the it wasn’t as hot as previous years but I still saw temperatures reported at 33 C and it may have been slightly hotter with the sun beaming down on you, no shade and being reflected up by the roads and cliff faces. Overall, my cooling strategy worked and the heat didn’t bother me massively. Did running in a Sauna suit help? It was a different type of heat running in the sauna suit and I’m not sure of the scientific benefit but it didn’t do my any harm and it helped sweat off a few pounds and perhaps gave me a slight mental boost (the placebo effect). Completing the race didn’t sink in for a few days to be honest and its only since I returned home and started thinking about these articles and my journey from average 24 hour 100 mile runner a year ago to turning in a 20 hour first 100 mile in Spartathlon and grinding out a finish with sore quads that I have started to gain some appreciation and satisfaction over my training and efforts leading up to and during the race. 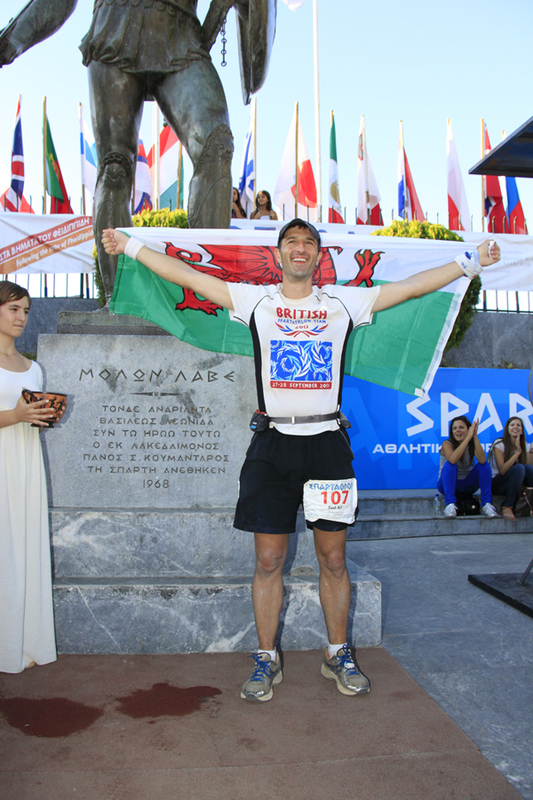 I don’t think the Spartathlon is a race that the average person is going to manage without any incidents and there is a lot to say about maintaining a positive mental attitude and issue management. As I mentioned in my report, when I couldn’t run, I marched as fast as I could, when I felt a little sick, I eased off, when I was hot, I dunked my cap and buff in water and tried to keep cool. However, everything I did was about how I could finish this race. There will be loads of people who will see me (and run past me!) 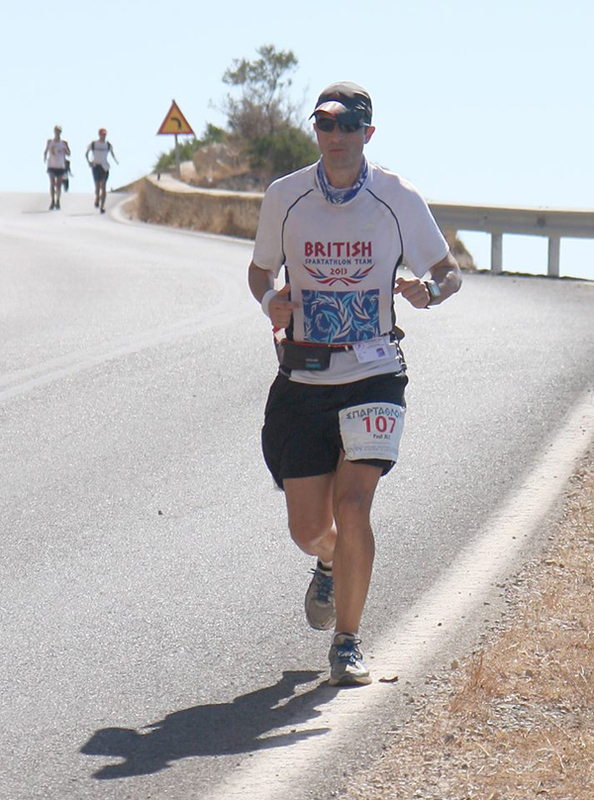 on a typical ultra who will undoubtedly be thinking if I can finish ahead of Paul, I can finish the Spartathlon. Having joined the illustrious club of finishers it would be easy to talk about how tough and how hard it is and you have to be an absolute hero to finish this but that is just playing to your ego and is not true at all. Many of you reading this (and I’m addressing this at the “average” ultra runner) have the physical ability to complete the race. Simply put you can do it. It’s a tough race but certainly not out of reach to a good many people. My words of warning are this. You have to take this event seriously and focus your training on this event (with hindsight I shouldn’t have tackled the Thames Ring a few weeks after the GUCR as this lost me a good 4-5 weeks of solid training). Your preparation, training and tapering should all be about this event. Secondly, you have to be mentally tough to endure this race. This what will carry you through the second half of the race. 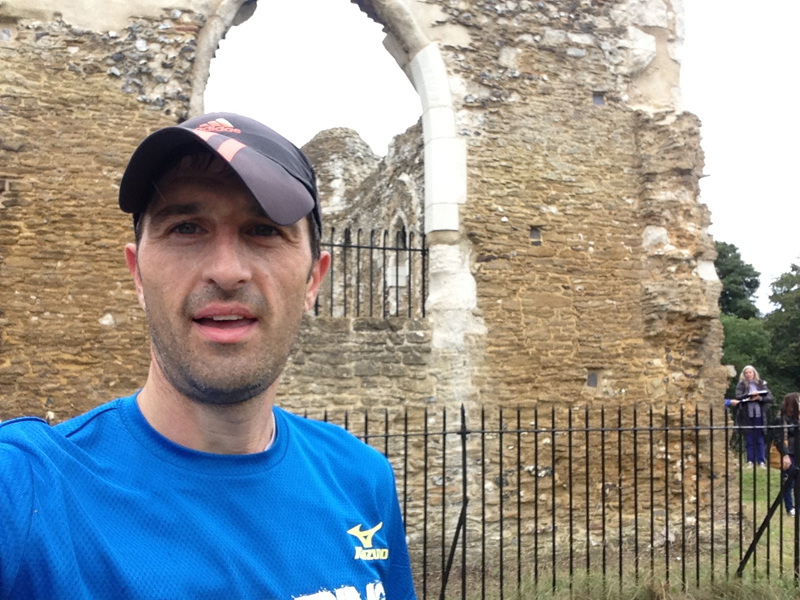 People have commented about my ability to endure some races, I still have those middle of the night doubts about “Why the hell am I out here” or “I’m just going to run 50 milers as I hate the night” but something keeps driving me to tough out a GUCR or a Thames Ring or a grim, muddy, rain soaked Caesars Camp. For me it’s the fear of failure, the day I return to the office with a DNF and my office hero status in pieces. It might be something different for you, whatever it is, cling to it, use it, think of the glorious end to the race and do not slip into that cycle of negativity. I finished this race in the worst physical state I have been in but strangely it didn’t feel like my toughest race, perhaps that’s the power of the mind at play. Finally, don’t judge runners or the race on reputation. Good runners finish, some really good runners don’t, some things go well, some things don’t. 50% plus of the people who enter the race won’t finish. Train well, be strong, be prepared, be confident and hopefully with a bit of luck that won’t be you. My race report covers this again, but the end of the race is glorious, walking down the high street towards the iconic Statue of Leonidas to the applause and cheers of the crowd is amazing. There’s almost a festival atmosphere at the end, it’s a truly special feeling to have experienced the finish and one which I will never forget. This is the lure of the race, the imagery that grabs and excites people and yes, it felt good. There is a great level of satisfaction completing the event knowing the race itself is fairly tough. In short if you get to the end, you’ve earned the right to enjoy it. I have to once again offer a thanks to James Adams for selling the race to me and being a great ambassador for British Runners. Hopefully, I can influence a new group of runners to give this race a go by showing it is achievable to a typical average ultra runner. Thanks for following this four part articles, I hope you’ve enjoyed my journey from start to a successful finish. I must admit to feeling slightly relieved that I did finish this event and could complete the article on a high note otherwise I would have felt I had let everyone down. 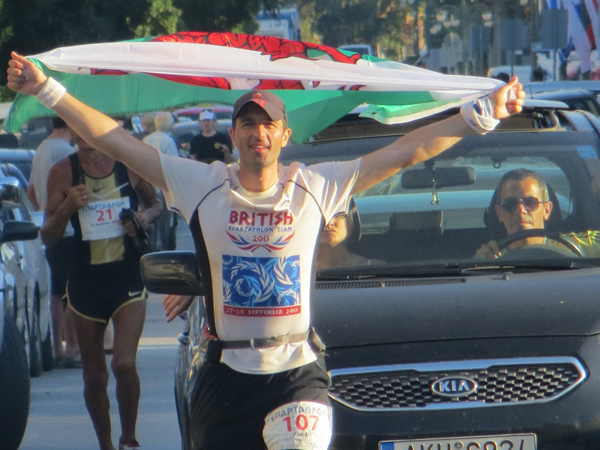 So Spartathlon 2014, who is tempted now? Just been catching up with all the posts – great reading! Thank you for taking the time to put them together. Congratulations once again Sir – top, top work!